Research shows PCBs can cause infertility in marine mammals and, sure enough, researchers discovered that Lulu had never birthed a calf, despite being well past reproductive age. Lulu was one of the United Kingdom’s last killer whales, and pathologists concluded the chemicals may have played a role in the decline of her pod. And now, new research shows just how detrimental PCBs may be, posing a bigger risk to killer whales than ever previously thought. PCBs are gnarly chemicals that were banned by the Environmental Protection Agency in 1979 after being linked to cancer, liver damage, and birth defects in both humans and animals. But by that time, we humans had already manufactured up to 3 billion pounds of it, some of which made it into the soil, air, and water via landfills or accidental spills. In some cases, it was directly applied to roads to minimize dust. PCBs have persisted in the environment for decades since—slowly accumulating up the marine food chain, from phytoplankton up to big predators like Lulu. While scientists have known for a long time PCBs can cause health problems in animals, until now no one really knew the effect of these chemicals on some animal populations, like Lulu’s pod, and how seriously they threaten the survival of an entire species—like killer whales. The new research, published Thursday in the journal Science, mapped out the projected effect of PCBs on 19 orca populations—and the results are bleak. More than half those populations are threatened by PCBs, researchers conclude, and several populations are at a “high risk of collapse over the next 100 years.” In general, the most threatened groups already have low population sizes (see table below) and live near places with historically high use of PCBs, like the United States and Europe. Of the 19 populations, some with moderate and high risk live close to home: off the coasts of Hawaii and Alaska. Others live near the United Kingdom, Japan, Greenland, Brazil, and the Canary Islands. Jean-Pierre Desforges, a postdoctoral researcher at Aarhus University and lead author on the study, tells Mother Jones his team chose to look at killer whales because, as top-of-the-food-chain predators, they are at the greatest risk because their prey can also contain large amounts of PCBs. “Killer whales are quite unique in that they’re feeding on seals, other whales—that makes them vulnerable to contamination,” he said. The results are a “wake-up call,” Jim Meador, an aquatic toxicologist at the National Oceanic and Atmospheric Administration who is not affiliated with the study, tells Mother Jones. But he also points out that the projections are based on models. No model can take into account every factor in the environment. “It’s like the weather [forecasts],” he said, adding, “It’s not proof of anything. It’s a prediction of the future.” Though, again, it’s a dire one. 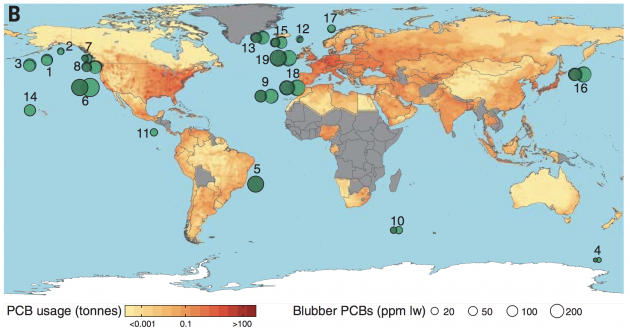 Even still, the authors note, this study only looked at PCBs’ effect on killer whale populations and didn’t include other stressors, like noise pollution, lack of food, and other chemical pollutants in the ocean. “If this class of chemicals can cause such significant harm, just think what effect multiple stressors could have,” Desforges says. As then-assistant EPA Administrator John Moore told the New York Times in 1987, less than 10 years after the chemicals were banned, the process of removing PCBs from the environment “will be measured in decades.” Thirty years later, this sentiment still rings true.